The circular design prevents corner crowding which can result in baby chick injury and/or suffocation. The lamp stand can be secured to the wall for added safety with the included cable ties. 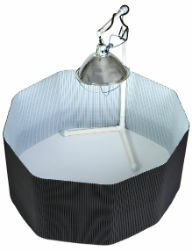 This stand is also adjustable allowing the height of the lamp to be modified as chicks grow. Enclosure measures approximately 3’ diameter and 16” tall when assembled and is suitable for up to 15 chicks, depending on breed.